Binance CEO Changpeng Zhao has announced the completion of the recent Binance Coin (BNB) burn. 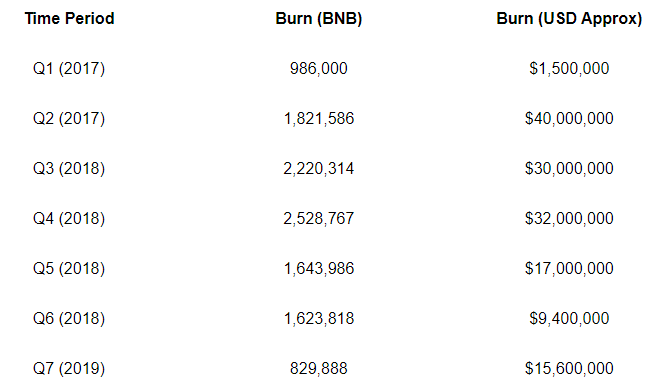 The seventh burn saw 828,888 BNB totalling $15.6 million, burned. Binance has completed another successful coin burn, CZ announced today. The quarterly coin burn by Binance is an ongoing process which will be continued until the total supply of BNB reaches 100 million BNB. The current burn rate of tokens is based on the number of trades performed on the exchange within a 3-month period. With the rising price in Binance coin, the recent burn of just 828,888 tokens totalled a whopping $15.6 million in value. The announcement by CZ admitted that the burn total was half of the burn amount of last quarter. However, the price of BNB has tripled since then, the report stated. Historically, this is the lowest amount of BNB to be burned since the inception of the quarterly coin burn. So far since inception, Binance has burned 11,654,359 BNB totalling $221 million in today's prices.